A sinister alliance of sword and kunai, the Red Guardian Ninja Sword and Thrower Set lets you conquer your foes in close hand-to-hand combat or at a distance! 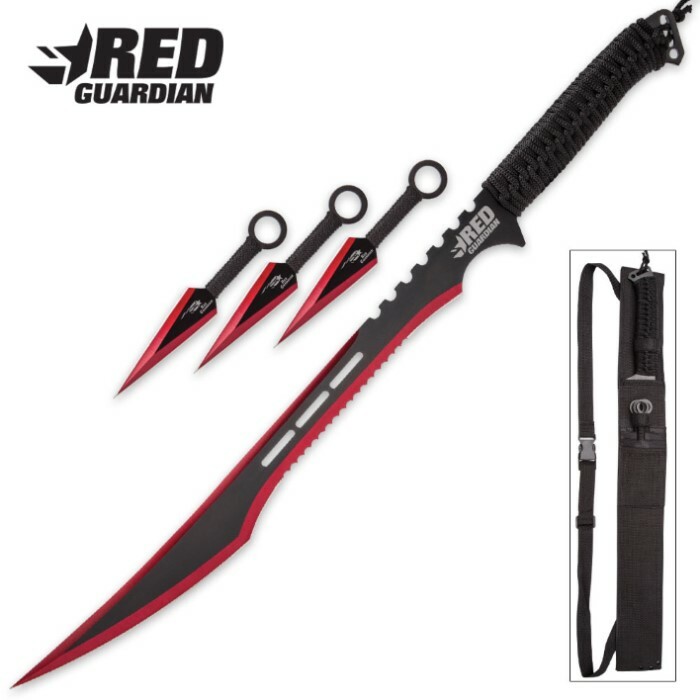 The black fantasy-style sword is accented with gleaming iridescent crimson red spine and edges, and its menacing profile is sure to strike fear in the heart of any adversary who lays eyes on it. But don’t be fooled by the “fantasy” moniker – this serious sword boasts a sharp, carefully honed 19 1/2” stainless steel blade with partial broad, rounded serrations that's plenty capable of tackling any cutting challenge. With impeccable balance and durable, water resistant black nylon cord-wrapped handles, this blue beast is a pleasure to wield, even for extended duels. If your enemies position themselves beyond the reach of the 27" long sword, brandish one or all three included kunai. Each long distance menace features a 3 5/8" spear point blade forged from razor sharp stainless steel. 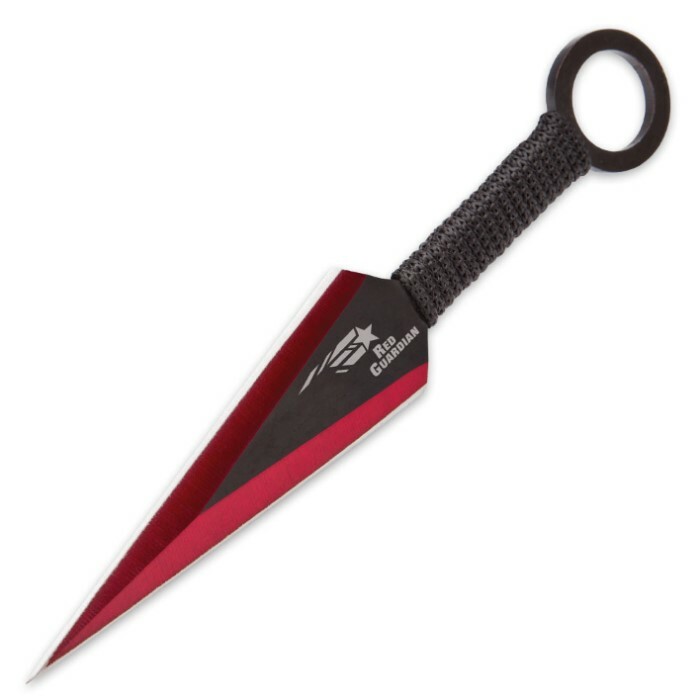 Perfect complements to the sword, these striking throwing weapons are embellished with the same crimson red edges and black cord-wrapped handles. 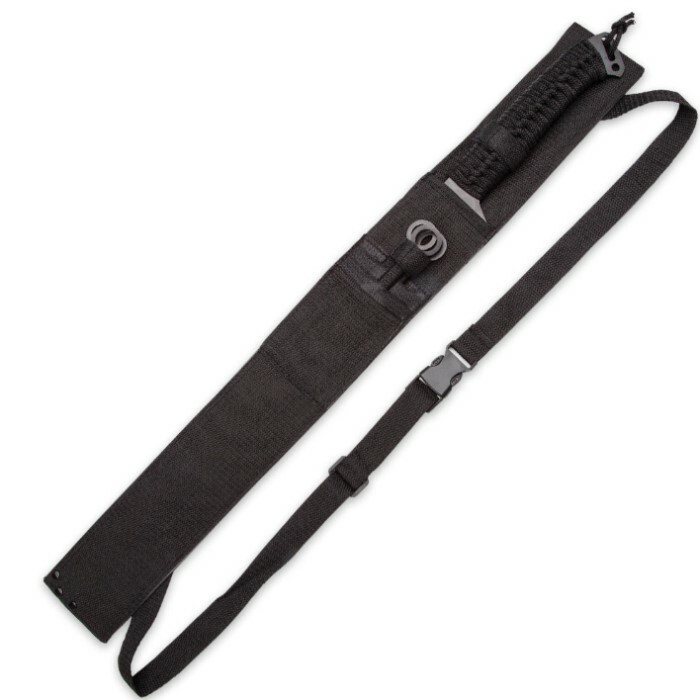 All three kunai and the sword fit snugly in a single heavy duty black nylon sheath, which includes a shoulder strap and belt loop for transport flexibility. If you don’t yet have a sword and throwing knife set in your collection, the Red Guardian Ninja set is an exceptional, affordable place to start. Even if your collection is brimming over with swords, daggers and knives of all shapes and sizes, it just isn’t complete without the stealthy form and tastefully subdued elegance of this stunning, potent ensemble.